Hello again! I'm back for a moment because I loved these photos so much that I thought they deserved their own post. 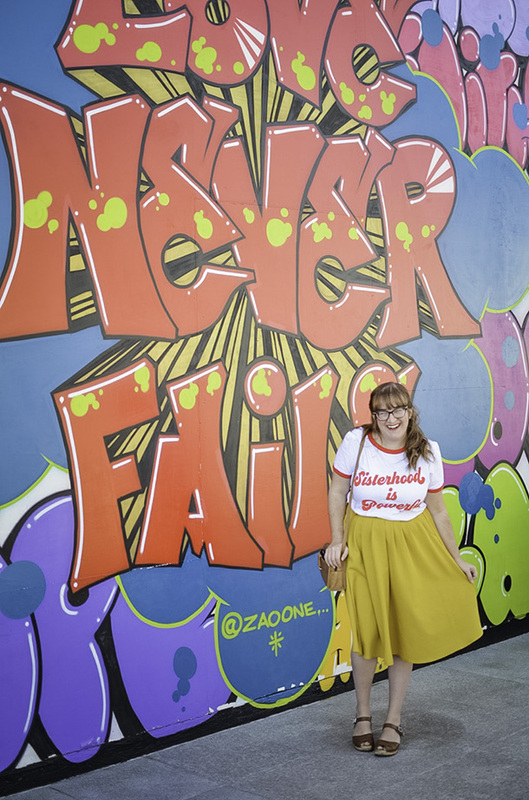 My love for Luella has been no secret, but this tee is by far my favorite item from the brand. I've been eye-ing it for a while (especially after Nicole rocked it so perfectly), and it's even more amazing in person. I keep thinking of 2017 as the year I truly embraced wearing color, but it's also the year I embraced T-shirts. I was so adamantly against them for too long, but I've loved learning how to incorporate them into my style. Of course, it helps that there are so many great brands and designers creating cute ones. 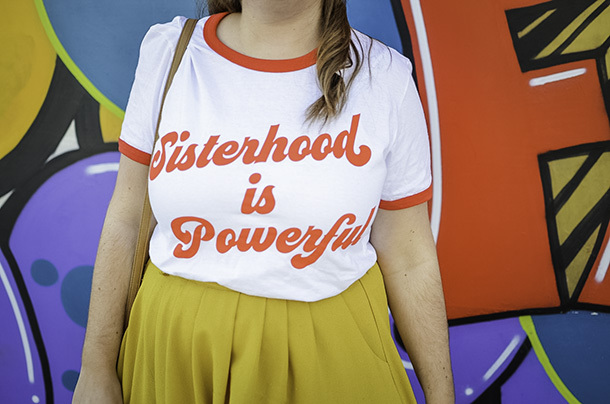 Seeing as "feminism" is officially the word of the year (though, let's face it, it's the unofficial word of every other year), it seems fitting to be celebrating sisterhood and love these days and all days. 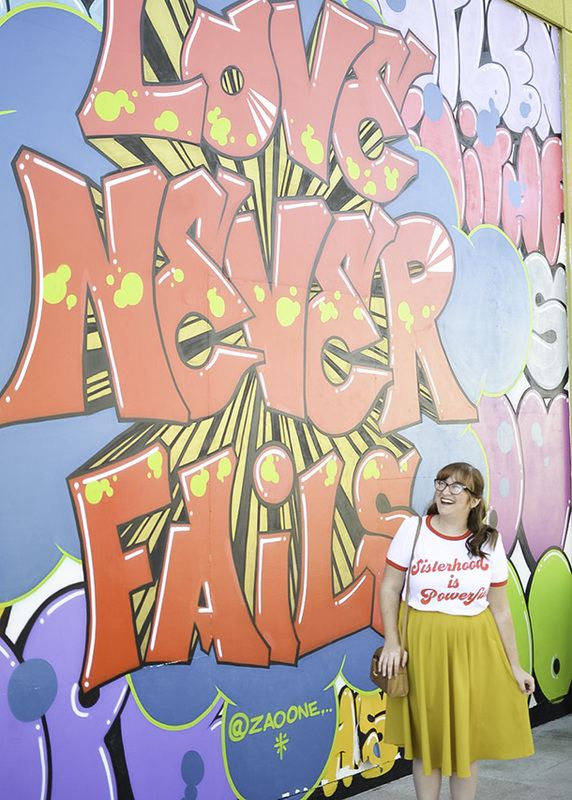 It felt like fate to find this "Love Never Fails" wall as well. You'd think I would have more of a life update after not posting for a month, but nah. Same old around here. Work is crazy (especially working in ecommerce this time of year), but we had a great Christmas party last week. Jon and I won a Google Home Mini and a PS4! Other than that, I finished all of my Christmas shopping, have been re-watching Bob's Burgers with Jon, have been binge watching Will & Grace for the first time on my own, and I visited a mansion in Beverly Hills with Erica over the weekend. I'm hoping to actually get to another blog post this week so share more about it. I just got Lightroom, so I'm actually pretty excited about taking the time to edit photos again, so maybe it'll happen! I'm also working on a project that will be a HUGE announcement soon, so make sure to be following me on Instagram for that in the next few weeks. I'm so excited, I can barely contain myself. Since the word of the year is chosen based on how many times it is looked up online at Merriman-Webster, I am torn between being happy people are looking it up to see what it actually means (instead of assuming it means either hating men or burning bras) and sad that they didn't already know and identify as feminists. Either way though, we all are going into 2018 more feministic, hopefully. LOVING the shirt! 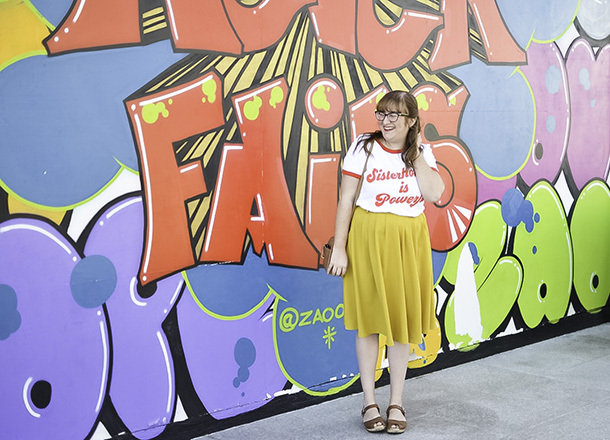 This wall is amazing and you look so good in yellow. Also you might be the first person to pull yellow and red off and not make me want french fries.